It was about 9:00 pm on a Saturday night. I wanted to bake something a little different, a little warm and comforting. I remembered of all the cakes, pies and cupcakes my Mother used to whip up so effortlessly (from scratch of course) I settled on making banana bread—after all warm banana bread is about as comforting as you could get. As usual, I prefer to cook and bake vegan and gluten free, i.e. without dairy, eggs or wheat. That way, it is easier to digest and will be as light and healthy as a banana bread could be. 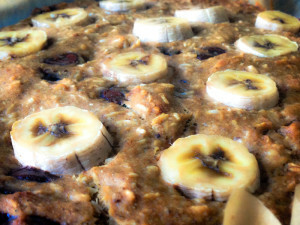 Plus, bananas being the main ingredient, it will offer a healthy serving of fruit. I took a basic recipe and swapped out to wheat-free and dairy-free ingredients, to make it more healthy and delicious. I mashed the bananas, put all the ingredients together and it was in the oven in no time. The smell coming from the kitchen was divine, and it tasted even more heavenly. My husband is my taste tester and my captive audience. I got rave reviews. That was a couple of weeks ago, I have made a few batches since then and I brought a batch to a friend’s dinner party also and got glowing feedback on this recipe. So here is the recipe, you will love it! 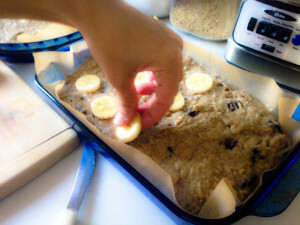 Get ready to be baking a lot of Chocolate Chip Banana Bread. And a shout out to Mom, thank you for continuing to inspire me. Enjoy! 1. Preheat oven to 325ºF. Line 2 medium pans with parchment paper. 2. Mash 6 Bananas in large bowl or mixer. 3. Mix Golden Flaxseed Meal with 3 tablespoons of water and set aside until thickened. 4. Mix Bananas and thickened Golden Flaxseed Meal together with all remaining wet ingredients, put aside. 5. Combine all dry ingredients in a large bowl, except Chocolate Chips. 6. Mix dry ingredients with wet ingredients into one large bowl, mix well until combined. 7. Stir in Chocolate Chips into batter. 8. Pour combined batter into pans evenly. 9. Place sliced banana chunks on top of batter, using remaining bananas. 10. Bake for 45 minutes, test by poking center top with a fork or toothpick. 11. Allow to cool a few minutes before cutting. 12. Cover pans with plastic wrap and keep in refrigerator until finished. Inspired by this recipe on yummybeet.com.